It is the event which made Britain an island, ripping us apart from France and creating the iconic white cliffs of Dover. Now scientists have the best evidence yet of how the first ‘Brexit’ from Europe happened nearly 450,000 years ago. A strip of ice-topped land once linked the white cliffs of Dover to Calais, but this land crumbled away when a lake over spilled and sparked powerful waterfalls, researchers have found. This would be the Doggerland flood if I recall correctly. If you read further down in the article it mentions the Doggerland Flood, which happened much more recently, around 6500 BCE. Before that flood, when sea levels were much lower (being fresh from the last glacial), an area of land called Doggerland connected Britain with Scandinavia and occupied what is now the North Sea. However, Britain had previously been split from the mainland before then, during a previous interglacial. The flood that caused that split, the VERY FIRST time it broke away, is the one being discussed, about 450 kya. yeah my genes trace back to the doggerland time period in the area of doggerland. That was about 10,000 years ago. Though this does make me wonder if other homonid existed in the UK region from before the first breakaway, I just keep coming back to the ideas of the various 'invasions' of celtic myth and wondering if there is the grain of truth to them that have to do with migration of homonids at various time in history. hmmm... you might find this interesting, it's an old article, but the findings indicate that humans had been living in Britain much earlier than previously thought. 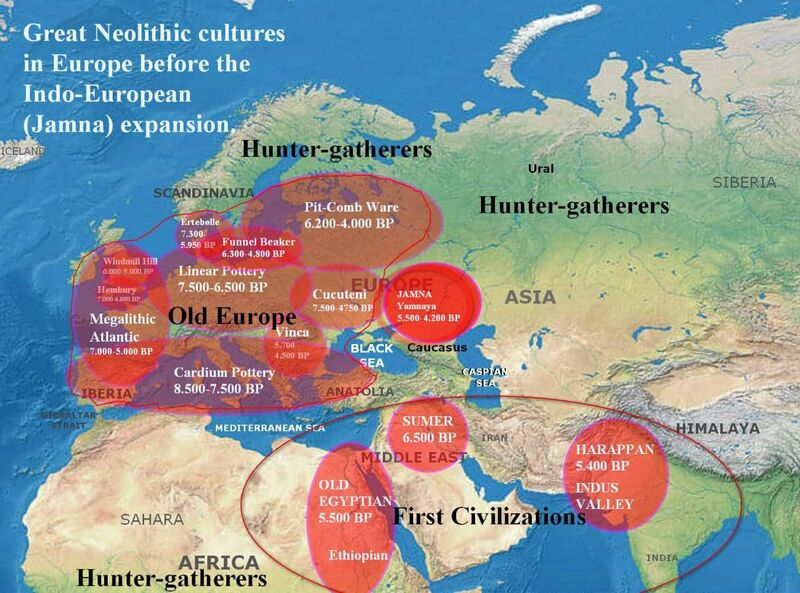 The first human species to arrive in Europe was, from what has been discovered so far, Homo Antecessor. They may had already been living in the UK over 800,000 years ago. The sarcophagus of Hercules brought from Zurich to Istanbul earlier this month was put on display in the museum of Antalya, a southern city where the second century artifact originated. Culture and Tourism Minister Numan Kurtulmuş attended an unveiling ceremony yesterday where the sarcophagus was covered in red velvet and circled with bougainvillea flowers. The sarcophagus is believed to have been stolen from the ancient city of Perge, 18 kilometers (11 miles) east of Antalya on the Mediterranean coast, sometime in the 1960s. After undergoing restoration in the U.K. several years ago, it was seized by Swiss customs authorities in 2010 for being in violation of Swiss trafficking laws. A Geneva prosecutor initiated an investigation into the matter in 2011, contacting Turkish authorities. Once both sides realized that the sarcophagus originated in Perge, the repatriation process began. On May 2, 2015, the Geneva Prosecutor's Office decided to return the ancient artifact to its home, which was approved by a court last year. The sarcophagus measures 2.35 meters to 1.12 meters (7.7 feet to 3.7 feet) and is categorized as a small Asian-style sarcophagus, or "Torre Nova." The fabled Twelve Labors of Hercules, from the killing of a mythological lion to cleaning the stables of a king, are depicted on the exterior of the sarcophagus. It was displayed at the University of Geneva's Museum of Art and History for three months before Turkish officials from Antalya Museum traveled there to oversee the move. The piece was placed next to the "Weary Heracles" statue, which itself was retrieved from the Boston Museum of Fine Arts. The top half of the statue was missing for decades before being located in the Boston museum, which purchased it in 1982. The bottom part was discovered in Perge in 1980 and was showcased in the Antalya Museum. Speaking at the ceremony, Kurtulmuş said the sarcophagus was "merely one artifact among thousands smuggled from Turkey." (History) No place on Earth was as coveted by the Vikings as Constantinople, but the Scandinavian warriors could never breach the formidable defenses of the world’s richest city in spite of repeated attacks. It was only after the Vikings became the personal bodyguards of the Byzantine emperor that they grabbed a piece of Constantinople’s wealth. The epic voyages of the Vikings to the British Isles, Iceland, North America and points west tend to obscure the fact that the Scandinavian warriors also ventured far to the east across Europe and parts of Asia. While the Danes and Norwegians sailed west, Swedish fighters and traders traveled in the opposite direction, enticed initially by the high-quality silver coins minted by the Abbasid Caliphate that sprawled across the Middle East. These Vikings who crossed the Baltic Sea and descended across Eastern Europe were branded “Rus”—possibly derived from “ruotsi,” a Finnish word for the Swedes meaning “a crew of oarsmen” and the term from which Russia receives its name. As the Rus migrated down the Dnieper and Volga Rivers, they established settlements along trade routes to the Black and Caspian Seas and conquered the native Slavic populations in present-day Russia, Belarus and Ukraine. By the middle of the ninth century, Rus merchants turned up in Baghdad. The capital of the Abbasid Caliphate may have been the world’s largest city with a population of more than one million people, but it failed to capture the Viking imagination like Constantinople, the capital of the Byzantine Empire that was said to harbor even greater riches. 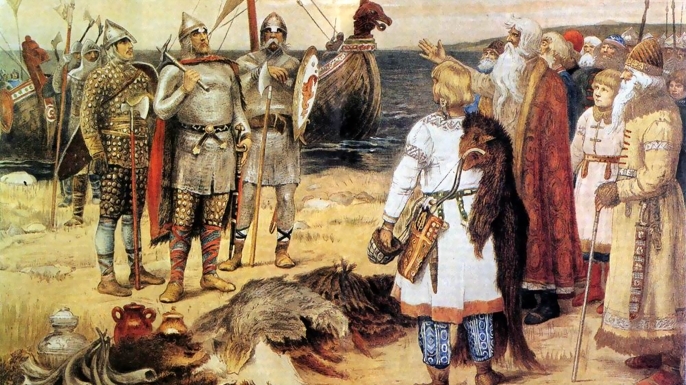 Painting of The Invitation of the Varangians: Rurik and his brothers arrive in Staraya Ladoga. Excavation finds in Crete in 2010 indicate that man traveled the Mediterranean 130,000 years ago, and not 10,000 years ago as originally believed, according to Science magazine. In an article entitled “Searching for a Stone Age Odysseus”, it says that up until a decade ago, archaeologists assumed that the adventurous travels of Odysseus, as reflected in Homer’s Odyssey, were the first ventures in the Mediterranean, placed 10,000 years ago. Or that sea travel was a human endeavor that started in the Bronze Age. However, excavators in 2010 claimed to have found stone tools in Crete dating back at least 130,000 years, leading to assumptions that man traveled the seas as early as in the Neanderthal stage. The recent find indicates that the Neanderthal was navigating the Mediterranean. After all, Crete was inhabited, and Crete has been an island for over five million years, meaning that the people who lived there, somehow sailed to Crete. Man, this is amazing. It really puts into perspective just how long we've been around. It's hard to wrap your head around the fact that there were humans sailing around 130,000 years ago. It's always amazing to read about how resourceful and complicated the people of the past were. They were exactly like us, but without the fancy technology. Two thousand years ago, on August 19, 14 AD, Caesar Augustus died. He was Rome’s first emperor, having won a civil war more than 40 years earlier that transformed the dysfunctional Roman Republic into an empire. Under Augustus and his successors, the empire experienced 200 years of relative peace and prosperity. Here are 40 maps that explain the Roman Empire — its rise and fall, its culture and economy, and how it laid the foundations of the modern world. All I get is "video is unavailable."